In a tense exchange during the Oct. 16 debate, President Barack Obama and Mitt Romney sparred over domestic oil and gas production on lands and in waters under the Obama administration’s control. The facts, for the most part, are on Romney’s side. 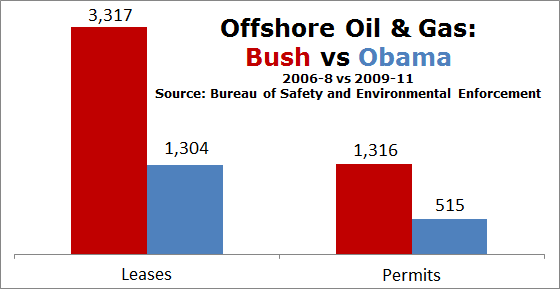 Obama was wrong when he denied Romney’s claim that the Obama administration cut in half the number of new permits and new leases for offshore oil and gas drilling. The decrease is actually more than half. Romney exaggerated, however, when he said the number of new permits and new leases for onshore drilling also declined by half under Obama. The decline isn’t that steep. Obama was wrong when he told Romney it’s “just not true” that domestic oil production on federal lands is down 14 percent and gas production has fallen 9 percent in one year. Production of oil and natural gas on federal lands and in federal waters did indeed fall by those percentages as Romney said, although Romney erred in saying the drops took place “this year.” The decreases occurred in fiscal year 2011. Romney failed to note, however, that oil production from federal jurisdictions has risen over the three-and-a-half years of Obama’s term. And while natural gas production has declined under Obama, the downturn started long before he took office. Romney’s claim reflects the larger Republican talking point that production of oil and natural gas has fallen on federal lands and in federal waters but increased on private and state-owned properties. As we’ve written before, the claim is true only for 2011. Romney and Obama argued during the first half hour of the town-hall-style debate — long after a man had asked a question about gasoline prices and energy policy. Romney: In the last four years, you cut permits and licenses on federal land and federal waters in half. Obama: Not true, Governor Romney. Romney: So how much did you cut them by? Romney: And — and — and production on private — on government lands is down. Obama: And the production is up. No it isn’t. Romney: Production on government land of oil is down 14 percent. Romney: And production of gas is down 9 percent. Obama: What you’re saying is just not true. It’s just not true. Obama was wrong to flatly deny that he cut in half the number of new federal permits and leases for oil and natural gas drilling. The number of new offshore leases has plummeted under Obama — falling by more than half, according to the Bureau of Safety and Environmental Enforcement. During Obama’s first term, the U.S. has so far issued 1,304 new offshore leases compared with 3,317 in Bush’s second term — a decrease of 61 percent. The number of new permits for offshore wells also nosedived. The U.S. approved 1,316 new permits during Bush’s second term. The number has fallen to 515 — so far — under Obama, also a 61 percent drop. The Obama administration had halted the drilling of all new offshore wells for one month after the explosion on the Deepwater Horizon oil rig in 2010, which killed 11 people and resulted in the largest oil spill in U.S. history. The administration then issued a months-long moratorium on the drilling of new deepwater wells. New safety requirements also slowed down the permitting process for new shallow-water wells. The administration, for instance, approved only 12 new offshore leases in 2011. Romney exaggerated, however, when he claimed the number of new permits and new leases for drilling on federal lands declined by half. The decline isn’t that steep, although the numbers have fallen under Obama. The numbers for new onshore leases and permits are organized by fiscal year, preventing us from making a precise comparison. Bush was president for nearly four months of fiscal year 2009. But the comparison changes only slightly whether or not fiscal year 2009 is included. First, we compared the last three full fiscal years of Bush’s term (2006 to 2008) with the next three fiscal years (2009 to 2011), which fall mostly but not entirely in Obama’s first term. The number of new leases fell by 42 percent — from 9,661 to 5,568. And the U.S. approved 37 percent fewer new drilling permits, which dropped from 20,479 to 12,821. We then compared fiscal years 2007 and 2008 against fiscal years 2010 and 2011. The number of new leases fell by 41 percent and permits by 39 percent. Later on in the debate, Obama said the decline in numbers was the result of his “use it or lose it policy,” which changed some lease terms and rates to encourage oil and natural gas companies to produce or let their leases expire. Regardless of Obama’s explanation, he was wrong when he flatly denied Romney’s claim about permits and leases. But Romney’s claim fails to tell the whole story. 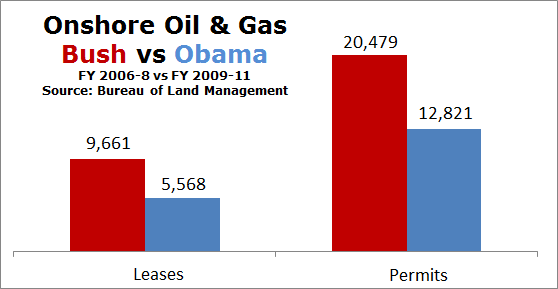 Oil production on federal lands and in federal waters has seen an overall increase under Obama. And natural gas production under federal jurisdiction has been falling since 2003, long before Obama took office. To Romney’s credit, he did specify earlier in the debate that the decline was over a one-year period, although “this year” is not the correct year. Romney: As a matter of fact, oil production is down 14 percent this year on federal land, and gas production is down 9 percent. Why? Because the president cut in half the number of licenses and permits for drilling on federal lands and in federal waters. It’s true — as Romney claimed — that production of oil and natural gas on federal lands and in federal waters fell 14 percent and 9 percent respectively in fiscal year 2011 (see table 1), according to the U.S. Energy Information Administration, an independent agency within the Department of Energy. Oil production on federal lands and in federal waters grew by 14 percent — or 241 million barrels of oil — during that time (see table 2). Adam Sieminski, the administrator of the EIA, explained to Congress in August that oil production on federal lands and in federal waters is dominated by offshore drilling. He said the decrease in production in 2011 reflects the impact and aftermath of the 2010 Gulf of Mexico oil spill. As we noted before, the Obama administration instituted a temporary moratorium on new drilling following the spill. But Sieminski offered a more complex explanation for why natural gas production on federal lands and in federal waters has declined, stating that federal policies are only one factor. Natural gas production on federal lands and in federal waters has fallen 9 percent overall under Obama (see table 3). We again compared the last three full fiscal years of Bush’s term with the next three years. But natural gas production on federal lands and in federal waters has been falling since 2003. Sieminski credited the decline with the boom in the method of extracting gas from shale formations, known as hydraulic fracturing or “fracking,” which occurs mostly on private and state-owned lands. Fracking has driven down the price of natural gas. And as a result, Sieminski explained, drilling on federal lands and in federal waters has become a less attractive method for producing natural gas.